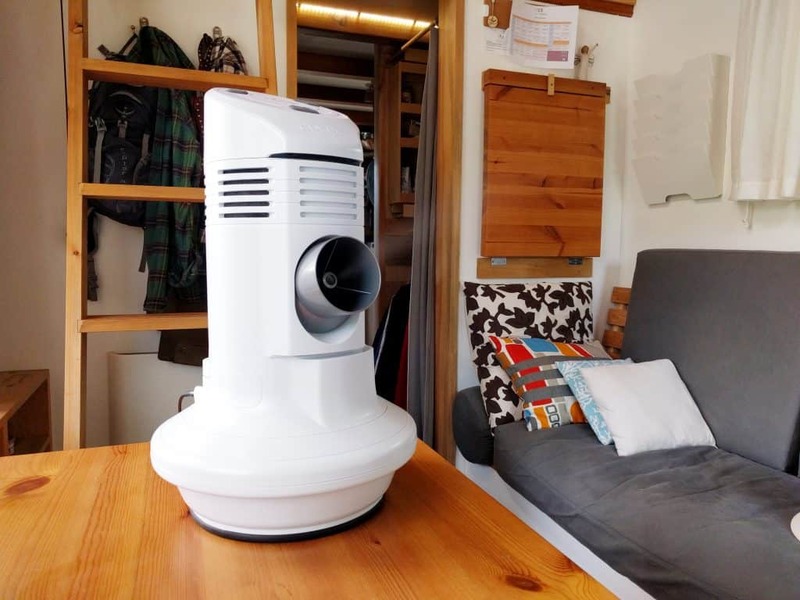 The kind folks at Culer recently sent me a SOLO Flash-Evaporative Air Cooler to test out in the tiny house environment. With the heat of summer quickly approaching here in Texas, this spring was the perfect time to test this personal cooler for its effectiveness. Here’s my review. The Culer SOLO is an attractive and solidly built little appliance. It comes in a cool white color and sports a clean design which I find attractive. It’s made of plastic, but seems robust. It’s designed with a wider base (also its water tank) which is great for stability but does mean it takes up a little more table or floor space in a tiny house. The Culer SOLO has a nice rubber base that keeps it snugly resting on any hard surface without the risk of scratching anything. 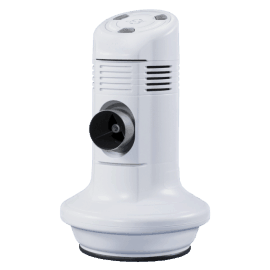 With the base firmly on the table or floor, the unit rotates left to right and the nozzle moves up and down to point the outgoing cool air in almost any direction. It seems like a very simple machine, and that it could maybe have been designed to be a bit more compact to take up a little less space. But I’m not going to take the thing apart to see exactly how its built. I’m just going to trust that they made it about as portable and compact as they could. Especially when the water tank is empty, it’s quite lite an easy to move from place to place. It has strategically located handle grooves that make carrying easy. There is also a larger Culer DUET available with 2 spray nozzles for greater cooling potential. The first thing to understand about performance is the difference between an evaporative cooler and an AC unit. They are totally different technologies, and cooling expectations need to be realistic. Air Conditioners are far more complicated and use chemicals to quickly transfer heat (and humidity) out of the air, exhausting hot air as heat is removed. Evaporative coolers do not remove any heat from the air. What they do is to introduce a stream of very humid air (filled with micro-droplets of water) onto the area to be cooled. Then the process of evaporation (which has a cooling effect — this is why we sweat to cool our bodies) makes this air (or anything in its path) feel cooler. Because they don’t actually remove hot air, and because they use evaporation only, an evaporative cooler’s overall cooling effect is far less and also far more localized than an AC. But they are simpler, far smaller and lighter, and much more energy efficient than an AC unit or a multi-piece mini split HVAC system. With all this in mind, I found the Culer SOLO to work very well for a fairly limited range of uses. The Culer SOLO is great to cool a single person when the air stream is pointed directly at their body. It truly is a “personal cooler” not a “room cooler” — and this is how it’s designed. On a warm or hot day, with a stream of micro water drops blasted at your face, it’s a wonderful refresher and helps keep the body feeling cooler overall. I tried it while working at my desk, or eating a meal. I gave my dog some relief on hot days by placing it on the floor next to her bed. I’ve used it outside while working and lounging on my deck. In each case, it feels great and works reliably — if the air is blowing directly at you (or your dog). If you are outside of the narrow air stream, you notice virtually no cooling effect. This is why it can’t cool a room. It just cools a narrow band of space right in front of the air nozzle. Because it requires evaporation to cool, my guess is it will work better when there is less humidity in the air than when it is super humid. The Culer SOLO is easy to use. Fill it with water and press the power button. Then select if you want “cool” or just “fan” and select the fan speed. That’s all. Unit includes a power adapter and requires standard outlet. Over time, some cleaning may be required, but there are instructions for maintenance. As stated above, the Culer SOLO works very well for a limited range of uses (personal cooling only — not entire rooms). It works well to help cool a single person when the air stream is pointed directly at that person. To be used on warm (but not really hot) days as primary cooler, when cooling the entire space of the house is not needed. The main point to stress is that the Culer SOLO Flash-Evaporative Air Cooler is not an AC replacement and is not intended to be one. If you want a smaller, personal cooler, this seems to be a great option. However, it’s price tag is a bit high compared to a small window AC unit (like this one), so if the type of windows you have will accept a standard window AC unit consider your climate and you intended use to make sure you get the most bang for your buck.